What changes just a week will bring – last Sunday we arrived home from our amazing weekend up at Great Wolf Lodge, and tonight I sit here to finally sum up our trip, while recovering from surgery and still in somewhat of a bit of pain (more on that at my other site). We left last Saturday straight from our 7-year-old’s cheerleading competition and drove up to Traverse City. The roads were a bit iffy at times, but all in all we made very good time. We checked in and got settled in our suite. One thing I’m coming to find as a family of five – is that many resorts and other lodging options aren’t set up for more than the typical 2 parents/2 kids scenario. 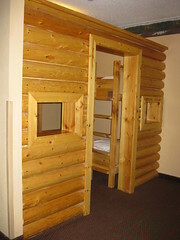 I was thrilled to discover that Great Wolf Lodge offers several different sizes and types of suites, and that almost all of them have a maximum occupancy of 6-8 persons. The KidCabin® Suite where we stayed was perfectly set up for us, with a queen-sized bed for Ron and I and then a separate area just for the kids that had a bunk bed, daybed, and its own television. Plus, it looked like a little log cabin, right in the middle of a hotel room – and the kids thought that was just the most amazing thing they’d ever seen. Much discussion ensued over who was to sleep where and they ended up with our oldest on the top bunk, our youngest on the bottom bunk and their middle sister on the daybed. One quick note as to the television – I have no idea what channels the kids’ tv offered in general, because they never changed it off of the default ‘Great Wolf Lodge’ channel, which included episodes of one of the girls’ favorite shows, “Toot and Puddle” – a cute cartoon shown on Nick Jr., all about travel and culture in different parts of the world. It was so nice as a parent not to have to wonder or worry about what they were watching, since everything I saw and heard on that tv was absolutely kid-friendly. 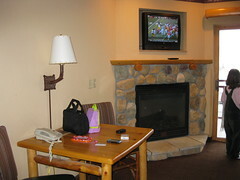 The suite also had amenities like a gas fireplace, small refrigerator and microwave, and there was free Wi-Fi throughout the entire resort – something I certainly appreciated. 🙂 We took a few minutes to wander around and check out our options for lunch – as well as the beautiful Snowland decorations in the lobby area. The lobby has the feel of a ski lodge, with a huge, open lobby that’s open to all floors and trimmed with timbers for a rustic feel. There’s a huge stone fireplace and a gorgeous clock tower – I could see that it’s an impressive room even without all of the holiday decorations. As we saw it though – the place was just breathtaking. 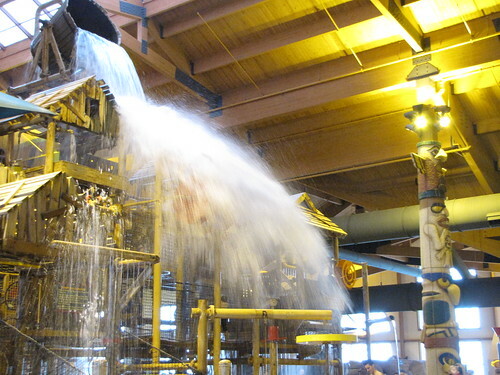 Over the two days we spent a great deal of time in the indoor water park – which is, of course, the main feature of the resort. Everything is set up within one huge ‘room’ with slides snaking their ways down from near the ceiling and all kinds of pools, splash areas, and such underneath. It’s designed in an extremely efficient manner and it’s quite impressive to see just how much they can fit in one space. The whole water park is dwarfed by the huge Fort Mackenzie, which is kind of a climbing apparatus-slash-splash pad-slash-steps to water slides. And on top is the giant bucket that dumps 1,000 gallons of water on top of those below every few minutes. A warning bell sounds beforehand so that you can either scramble out of – or into – the way of the rush of water. Out of my kids, only my 7-year-old ran to get dumped on every chance she had. My oldest and youngest experienced it once, as did I – there’s really nothing quite like it. I think the area where we spent the most time altogether was the Chinook Cove Activity Pool. My older girls had fun swimming around and as a family we had a blast with the water basketball hoops. The deepest part of the pool was only 4 feet and a good portion is only 3 feet 6 inches deep – easy for my older girls to touch the ground. Even my youngest had fun in there, being held by her father or I, and with a life jacket on. In fact, there are racks of life jackets all over the water park so it’s easy to make sure that your little ones or non-swimmers are as safe as possible. Another area that we really liked was the Crooked Creek (or what we usually refer to as a ‘lazy river’), where you can simply float along on an inner tube – either alone or on a double tube with someone else. Again, it’s shallow enough that even the older kids could touch the bottom if they needed to, but the idea is just to relax and let the current carry you as many times around as you want. There are also two hot tubs – one for families and one that’s adults-only. It was a nice break to be able to just sit and relax in the hot water and take a break from all of the activity. But then the girls would be off and about again. :) One thing to keep in mind is that if you have more kids than adults in your group it can be hard to keep track of everyone at once. My husband and I found ourselves spending much of the time chasing the kids and making sure we knew where everyone was at. We finally gave our oldest a little bit of leeway to go off on her own (3 kids going in 3 different directions with only 2 parents just doesn’t add up), but I think when we go back someday, we’ll consider bringing either another adult with us (my brother comes to mind – he’d have a blast!) or maybe an older kid or teenager. The first day we were there was a little more difficult since the pool/slide area for kids under 48 inches tall was closed. The second day it was open however, and my 3-year-old spent a good portion of her time splashing around in there. There are lots of knobs and gears to turn, water to send in different directions, buckets to dump and since this pool area has a ‘beach style’ entrance where the water starts off just inches deep and gradually gets deeper, even little toddlers can splash around. In its deepest point, I think it only came to my knees, and I saw quite a few little ones walking and splashing around with no trouble. There are even two kiddie slides, which were a bit hit with my younger two girls, both of whom are under 48 inches tall. Yes, we did go down some of the bigger water slides, but really only a few times. I can see those being something for my girls to grow into a bit more – especially some of the much taller slides where you go down on rafts. In general, we found plenty to do and had such a fun time together as a family. Food-wise, there are several options on the Great Wolf Lodge site – from a snack bar down inside the water park area, to sit-down restaurants off the lobby area and even a sweet shop that offers ice cream, fudge and more. 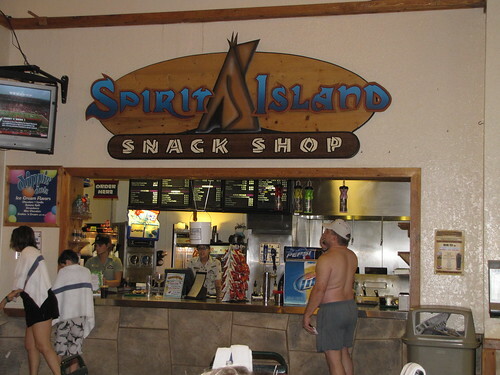 We ate at two of these – our lunch the first day was inside the water park at the Spirit Island Snack Shop, where we had hot dogs, pizza, fries, soft drinks and cookies for dessert (they came with the kids’ meals). And our dinner that night was at the Loose Moose Cottage, where we dined underneath trees on typical American fare like burgers, sandwiches and more, in what felt like a giant campsite – an ambiance added to by the fact that the kids were all in pajamas at the time. 🙂 I think that the food prices were typical of a resort – definitely higher than what we would’ve paid off-site, but there’s no questioning the convenience of not having to bundle everyone up and pack them all back in the van to go elsewhere. In addition to the usual daily activities were quite a few events held due to the Snowland celebration. 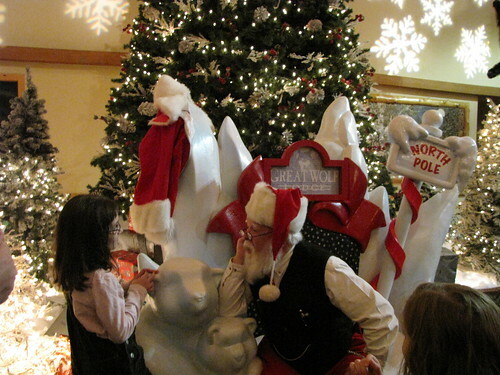 Especially with this being the first weekend of Snowland – we were treated to the arrival of Santa Claus himself and the opportunity for the kids to visit with him. Unfortunately not all of my girls would sit with Santa – my oldest would only talk to him from a distance, but they were able to share what they wanted for Christmas and Santa was quite patient and good-natured. 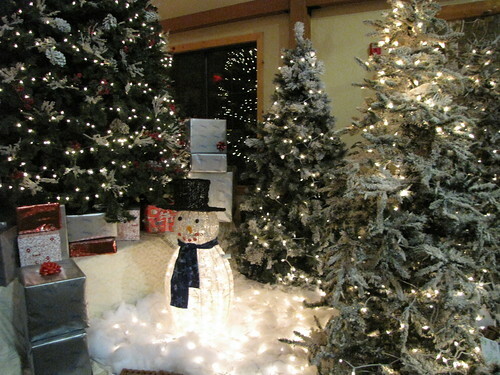 In fact, during the twice-nightly storytime, held in the lobby for all of the kids to enjoy before bedtime, we were amazed not only to experience it snowing right in the lobby, but also to have the story read to us by St. Nick himself – followed by a wonderful rendition of “Twas the Night Before Christmas”. As a blogger event, I thought that this was in general very well done. They invited 10 of us up along with our families – something I hadn’t experienced before, but greatly appreciated. 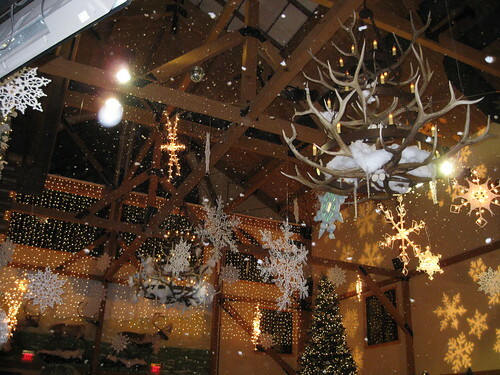 As a ‘family’ resort, it was amazing to be able to experience Great Wolf Lodge along with my family. We were all treated to a lavish breakfast by the resort and given the opportunity to talk with and have questions answered by their PR team. It was also a great time to meet the other bloggers and their families because there really wasn’t any other chance to figure out who everyone was or have much time to talk. They even had crafts for the kids to do after eating to give we parents a little break and the chance to finish eating without interruption. Drive your kids safely this holiday season! Tackling… everything?